Eyvind Earle - Coastal Paradise. Photograph: Courtesy Earle Family Trust. Eyvind Earle – Paradise. Photograph: Courtesy Earle Family Trust. 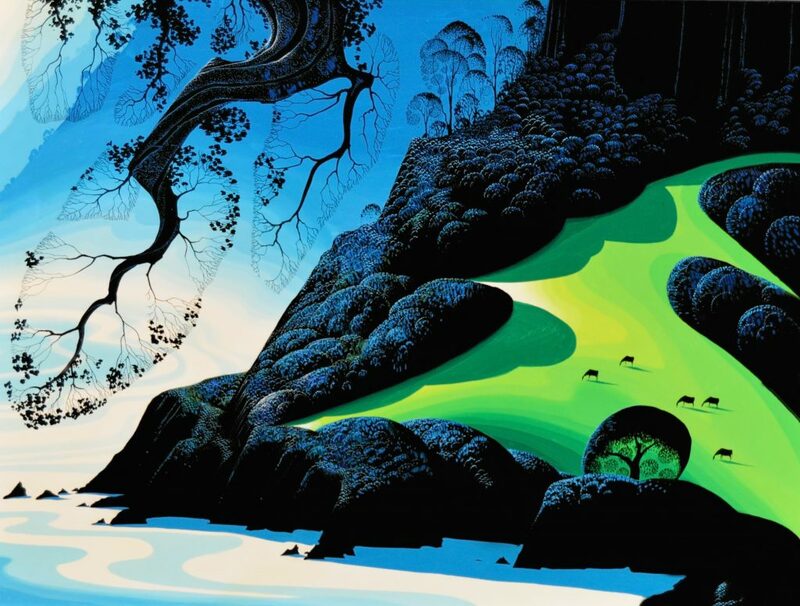 Magical and otherworldly Sumptuous landscapes rendered in vivid hues the imagery of fine artist Eyvind Earle has to be seen to be believed. A gorgeous exhibition, Eyvind Earle: An Exhibit of a Disney Legendis now on view at Forest Lawn Museum through January 1, 2017. An American artist, author and illustrator (19162000), Earle is renowned for his contribution to the background illustration and styling of Disney animated films in the 1950s. Major institutions such as The Metropolitan Museum of Art in New York, the Rahr West Art Museum, Phoenix Art Museum and Arizona State University Art Museum have purchased Earles works for their permanent collections. Eyvind Earle – Purple Fog. Photograph: Courtesy Earle Family Trust. Earle is best known for creating the look for Disneys classic animated feature film Sleeping Beauty (1959) andthe dioramas for Sleeping Beauty Castle at Disneyland. Subsequently, La Chateau de la Belle au Bois Dormant, as well as Sleeping Beauty Castle in Disneyland Paris, based its surroundings on Earles film designs.His work continues to be an important contribution and inspiration to the art world today. Representing a career retrospective and centennial celebration, this awe-inspiring exhibition is a rare opportunity to see his original works such as his eye-popping oil paintings, delicate watercolors, expert drawings and sketches, many of which have never before been presented for public display. There aremore than65 works from the late artist, including three background paintings fromSleeping Beauty, on loan from the Walt Disney Animation Research Library. Eyvind Earle: An Exhibit of a Disney Legend marks the artists first major exhibition in Los Angeles in 25 years, spanning seven decades that highlight Earles legacy, distinctive stylemysterious, primitive, disciplined, and nostalgicand remarkable technical skill. His acrylic and the oil paintings shimmer, their many layers of transparent glazes and lacquers creating a mirror-like finish. Earle created his own formula for the varnishes he used, often tinting them with glues. Later he experimented with marine varnishes which were impervious to water and did not require the addition of glue. Because he needed to wait for the layers to dry, Earle often worked on up to thirty paintings at the same time. You can see influences of Japanese art and science fiction in the exquisite fantasy worlds Earle created with his brushes. The vibrant colors have an unreal quality to them, reminiscent of the manufactured worlds in todays digital video games. Many of Earles art works are accompanied by a self-penned poem. By the time he arrived at Disney Studios in 1951,Earle was already a well-established fine artist. But he was eager to prove himself in animation. Now an icon in the animation world, Earle was given complete artistic control by Walt Disney for the concepts and execution of the look and style of the animated musical fantasy film Sleeping Beauty. Granted carte blanche by Walt himself did not sit well with others on the animation team, in particular the supervising director Clyde Geronimi. Earle says for the style of the backgrounds he found inspiration in Italian Renaissance utilizing works from Albrecht Drer, Pieter Bruegel, Nicolaas van Eyck, Sandro Botticelli, as well as Persian art and Japanese prints. Sleeping Beauty was the first animated film to be photographed in the Super Technirama 70 widescreen process, as well as the second full-length animated feature film to be filmed in anamorphic widescreen, following Disneys own Lady and the Tramp four years earlier in 1955. 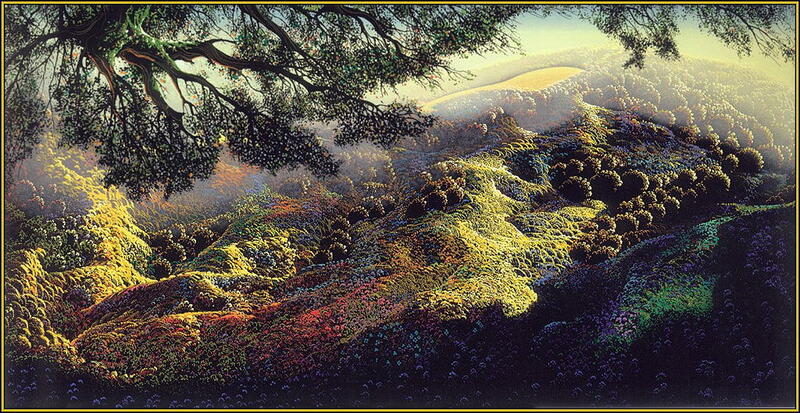 Eyvind Earle – Background painting for Sleeping Beauty. Exhibition runs through January 1, 2017. The Memorial Park is open seven days a week from 8 am to 5 pm (6 pm during DST). The Great Mausoleum and Memorial Park churches are open seven days a week from 9 am to 4 pm. Mortuary visitation hours are seven days a week 8 am to 9 pm. Eyvind Earle – Coastal Paradise. Photograph: Courtesy Earle Family Trust. 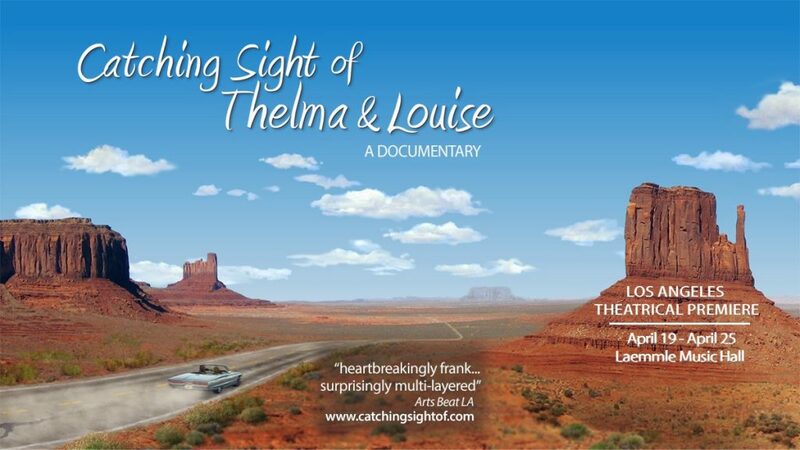 Earles work, found in the personal collections of filmmakers Guillermo del Toro and Peter Jackson, writer Dean Koontz and others, is recognized for its truly original perception of landscape that simultaneously captured the grandeur and simplicity of the American countryside. His work portrayed the natural landscapes atmosphere, color and lighting, and conveyed, through suggestions of distance, landmass and mood, a magical, awe-inspiring ghostliness of the elements. This exhibition celebrates Earle as one of the most innovative landscape masters of his timeinspiring a new generation of artists working today. To this day, much of Earles work remains unclassifiableneither contemporary nor classic with perhaps one of the more predominant features of his master landscapes being large geometric forms, employed to their fullest to bring a supernatural aura to everything from hills to distant waves. Earles unique technique has been praised for its delicate mood as much as its meticulous attention to detail. During his long and prolific career, Earle also embraced various artistic mediums, including book illustration, animation, watercolor, oil, sculpture, drawing, serigraphy, and poetry. Born 100 years ago in New York and raised in Southern California since the age of two, Eyvind Earle began painting at the age of 10. In 1927 his parents divorced and he was kidnapped by his father, Ferdinand Earle, who took him traveling over the next four years through Mexico, Cuba and Europe. During this time, his father gave him a challenging choice: read 50 pages of a book or paint a picture every day. Earle chose both. By the age of 14, Earle had enough work to launch his first one-man showing in France. A year later, Earle left his father in Europe to return home to his mother in Hollywood. He feared he would never paint again because he would not be forced to. But when he was 15 he had a great desire to spend more time painting and he dropped out of Fairfax High School shortly before his graduation. Soon after, he took a job as an assistant sketch artist at United Artists studio. By age 21, Earle bicycled across the country from Hollywood to New York City, paying his way by painting 42 watercolors and showing the work in New York in a series of one-man shows. He sold his first watercolor to the New York Metropolitan Museum of Art for their permanent collection when he was only 23. Earles earliest work was strictly realistic, but after having studied in his twenties a variety of masters such as Vincent Van Gogh, Paul Czanne, Norman Rockwell, and Georgia OKeefe, he came into his own unique stylean oeuvre characterized by a simplicity, directness and surety of handling. Beginning in the 1940s and continuing for five decades, Earle adapted his creative landscapes to Christmas cards, painting more than 800 designs that have sold more than 300 million copies. In 1943, the American poet William Carlos Williams commissioned Earle to create a painting for his home in Rutherford, New Jersey. View Under the Bridge, is a monumental 13-by-6-foot oil on canvas depicting the construction of New York City from a view under the bridges of Manhattan. It is counted among Earles early and rarest works and had not been seen by the public until it was recently restored and placed on permanent loan to the World Trade by the granddaughter of Williams. In 1951, Earle joined Walt Disney Studios as an assistant background painter. Earle intrigued Walt Disney in 1953 when he created the look of Toot, Whistle, Plunk and Boom, an animated short that won an Academy Award and a Cannes Film Festival Award. Earle was kept busy at Disney for the better part of a decade, painting the settings for such stories as Peter Pan (1953) and Lady and the Tramp (1955), as well as the animated shorts Working for Peanuts (1953), For Whom the Bulls Toil (1953), Pigs is Pigs (1954) and Paul Bunyan (1958). Earle was responsible for the styling, backgrounds and colors for the highly acclaimed Sleeping Beauty, giving the movie its magical, medieval look. Earles lead on Sleeping Beauty would become the pinnacle of his work for Disney. Earles striking designs for Sleeping Beauty broke the mold, and the films castle and forest scenes were the first to incorporate pre-Renaissance Gothic motifs with ideas borrowed from Persian miniature paintings and Japanese prints. His ambitious design and intense dedication to detail on each of Sleeping Beautys backgrounds continue to be the main force behind the movies classification as one of the most artistically distinct and best-looking Disney films to date. Earle was also responsible for painting the dioramas for Sleeping Beauty Castle at Disneyland. Subsequently, La Chateau de la Belle au Bois Dormant, Sleeping Beauty Castle in Disneyland Paris, based its surroundings on Earles film designs. I first fell in love with the work of Eyvind Earle as a young girl when I saw it in Sleeping Beauty Castle at Disneyland, and Ive admired it ever since, said exhibition curator Joan Adan De Santis. What a thrill to be curating the retrospective of his work so many years later. In 1960, Earle founded his own motion picture animation company, Eyvind Earle Productions, Inc., creating the trailer for West Side Story (1961), the title for the Kraft Suspense Theatre, and the logo trademark for Universal Pictures. He also created television commercials for Chrysler, Chevrolet, Motorola, Kelloggs, among others. Earle’s animated creations saw success with various animated television specials, most notably the long-running version of the Nativity created for Tennessee Ernie Ford’s Story of Christmas Special (1963). In 2015, the Walt Disney Company posthumously awarded Earle the prestigious Disney Legend Award for his work on Sleeping Beauty and contributions to animation, accepted by his daughter, Kristin Thompson of Seattle. After about 15 years of making animated art, Earle returned to painting full time in 1966 and kept working until near the end of his life. In addition to his watercolors, oils, sculptures, drawings and scratchboards, in 1974 he began making limited edition serigraphs. His work captures the grandeur and simplicity of the American countryside with lyric ardor. For 70 years, Ive painted paintings, and Im constantly and everlastingly overwhelmed at the stupendous infinity of nature, Earle wrote in 1996, during a time late in his career when his work was receiving a renaissance of acclaim. Wherever I turn and look, there I see creation. Art is creating. Art is the search for truth. Eyvind Earle: An Exhibit of a Disney Legend makes publicly accessiblemany for the first timethese unique works thanks to his familys personal collection, loans by other private collectors, and Eyvind Earle Publishing LLC in Monterey, California, where Earle spent the last years of his life capturing the landscape on canvas. Featuring a mix of paintings and early drawings, this exhibition includes captivating works such as: Ancient Forest, Silent Meadow, Paradise, Three Noble Horses and Purple Fog, which was one of Earles personal favorites. Eyvind Earle died on July 20, 2000 at the age of 84. An Exhibit of a Disney Legend is a uniquely California-centric exhibition that builds on Forest Lawn Museums ongoing efforts to present subjects and installations that resonate with contemporary society and todays broader cultural context. Forest Lawn Museum has been named one of the Top 10 Free Museums in the country by Yahoo Travel. It is located on the 290-acre Forest Lawn Memorial Park Glendale, where Earles father and brother are interred, and which has been a renowned Southern California landmark since 1906. Featuring a stunning array of art, architecture and three beautiful chapelsForest Lawn Museum is committed to enriching the community through the educational presentation of artwork that focuses on history, culture and religion. Founded in 1906, Forest Lawn has been a Southern California landmark for more than a century. With rolling hills, sweeping landscapes and a magnificent view of the Los Angeles skyline, Forest LawnGlendale is one of Forest Lawns most picturesque locations. It features a world-renowned art museum, extraordinary statuary and the Hall of the Crucifixion-Resurrection, home to Jan Stykas immense painting, The Crucifixion, and Robert Clarks Resurrection, two of the largest religious paintings in the western hemisphere. Forest LawnGlendale is located at 1712 South Glendale Avenue, Glendale, CA 91205. The Memorial Park is open seven days a week from 8 am to 5 pm (6 pm during DST). The Great Mausoleum and Memorial Park churches are open seven days a week from 9 am to 4 pm. Mortuary visitation hours are seven days a week 8 am to 9 pm. For more information, visit the Forest Lawn website at www.forestlawn.com, Facebook at facebook.com/forestlawn or Twitter @ForestLawn, or call 888.204.3131 (for international calls +1.323.254.3131). For more than a century, Forest Lawn has been an integral part of Southern California. Since its founding, Forest Lawn has committed itself to providing outstanding service and beautiful environments for family outings, remembering loved ones and commemorating holidays. Forest Lawns locations in the Los Angeles, Orange and Riverside counties serve all faiths and cultures, and offer a wide range of celebrations and special events with competitively priced cremation and traditional funeral services throughout Southern California.